Early on, Sandra Ramirez found herself in a position unique to most children — as a translator for her parents, who immigrated to the United States from Guatemala and did not speak English. 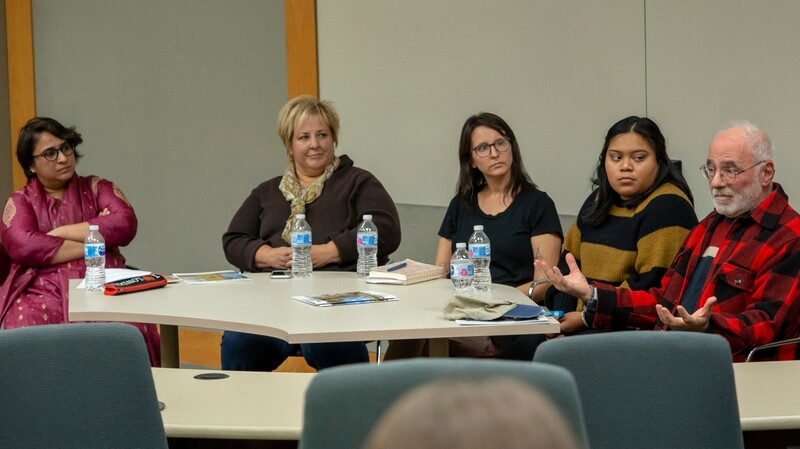 Ramirez, now 18, was one of four panelists who shared their personal experiences and expertise during a discussion about the current challenges facing immigrants and refugees at UC Clermont College on Oct. 17. Ramirez now works for the Intercommunity Justice and Peace Center, educating the community and advocating about immigrant rights — even traveling to the border to work with new refugees in detention centers — all while studying to become a nurse practitioner. Her own parents’ struggles have made her passionate about helping others who are new to this country. “We should give immigrants the dignity of paperwork and the ability to work when they cross the border,” Ramirez said. UC Clermont Associate Professor Anu Chatterjee, herself an immigrant from India, moderated the panel and said that immigrants are often “living in an in-between space” as they work through the arduous, lengthy process of becoming permanent residents or U.S. citizens. “Moving to a new country and leaving everything you know behind is an act of faith for most immigrants,” Chatterjee said. Panelist Sheryl Rajbhandari witnessed those trials firsthand through the experience of her husband, an immigrant from Nepal. Today, she runs Heartfelt Tidbits, a 100-percent volunteer-based nonprofit that has helped more than 40,000 refugees and immigrants call Cincinnati home since 2008. The organization focuses on empowering immigrant families to reach self-sufficiency through an extensive support network and innovative programming. Rajbhandari has also partnered with panelist Cal Cullen, an artist with Wave Pool Arts Center, on the Welcome Project, which helps immigrants with limited English-speaking skills create and sell art. The project helps the immigrants, mostly women, connect with each other, learn English and develop marketable skills. Saad Ghosn, another panelist, Lebanese immigrant, physician and founder of SOS Art Cincinnati, believes that such basic values are developed in each person early in life. The panel was part of the exhibit featured through Oct. 31 in UC Clermont’s Park National Bank Art Gallery, “New World: Refugees and Immigrants Photograph the Experience of New Life in America.” Learn more about the UC Clermont gallery here.